SecuGen Corporation is the world's leading provider of advanced, optical fingerprint recognition technology, products, tools and platforms for physical and information security. 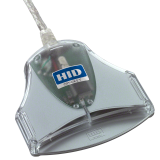 SecuGen designs and develops FBI-certified fingerprint readers and OEM components. Known for high quality, ruggedness, and price-performance, SecuGen’s products are used across a wide range of industries, market segments and applications around the world including insurance and banking, medical and health care, point of sale, logical and physical access control, mobile devices, AFIS and law enforcement, and national ID and voter ID projects. SecuGen is a registered trademark of SecuGen Corp. in the United States and other countries.SecuGen®. While most of the models have a fingerprint sensor only, there are 2 models combined with a contact smart card reader. Those models open a world of new possibilities for special applications. 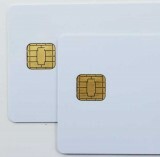 Fingerprint template size is about 500 bytes in and can be securely stored in almost any chip card. A good programmer can make great use of that feature + ID USB reader so card holder must confirm person's identity by presenting finger.